Learning means a lot more than meeting the school curriculum. Only a small part of it can be done in classrooms, it includes lots of additional activities outside of school. Present-day Hungarian public education is traditionally knowledge-driven. Learning normally does not include field activities, even though these extracurricular field activities are the ones giving the pupils a chance to observe the natural phenomena in their natural place and to understand what they learned through their experiences. In some areas that are particularly important in today's educational system, like environmentally conscious education or sustainability education, the field activities would be especially important. They are also needed to understand the connections, the problems and the possible solutions between nature and society. For this purpose institutions and devices that are able to aid the learning process are needed. Borbála nature trail that we designed presents the industrial history of the once thriving industrial city, Salgótarján and it is a perfect place for field activities. The theme of the nature trail can be inserted into the curriculum at several places, including environmentally conscious education at the topic of man-made environment and it can also be found among the topics of sustainability education. Johnson, B.B. (2014): How perceived gains and losses from nature trails affect trail management preferences. Journal of Environmental Psychology. Volume(40) pp. 430-439. Makádi M. (2015): A természetismeret tanítása és tanulása. Eötvös Loránd Tudományegyetem, Természettudományi Kar. Budapest. pp. 254-265, 339-370. McPherson, F.C., Mayer, S.F. 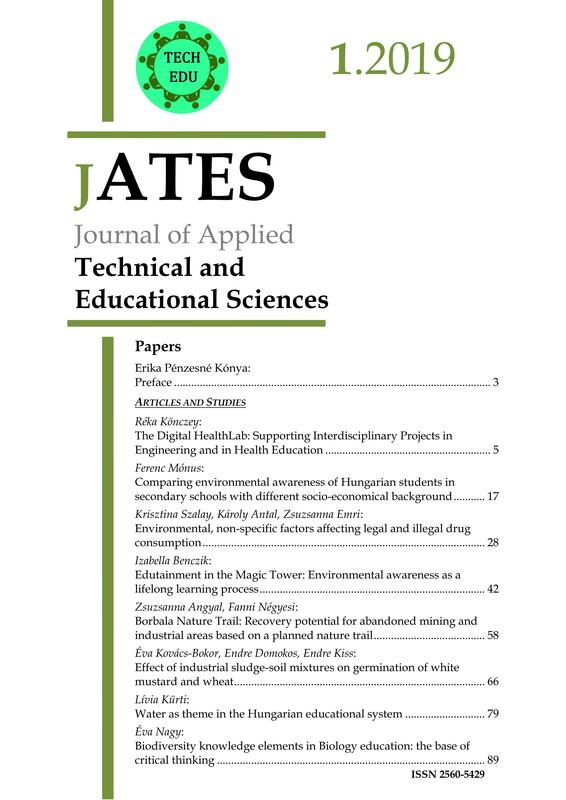 (2014): The importance of connection to nature in assessing environmental education programs. Studies in Educational Evaluation. Volume(41) pp. 85-89. Sebestyén K., Szvircsek F. (1997): Salgótarjáni új almanach. Nógrádi Történeti Múzeum Baráti Köre. Salgótarján. pp. 6-10, 29-31, 88-141, 172-174. Sever, I., Verbic, M., Marusic, Z. (2018): Measuring trail users’ perception of crowding in a peri-urban nature park: A best-worst scaling experiment. Urban Forestry & Urban Greening. Volume(35) pp. 202-210. Siegmar, O., Pensini P. (2017): Nature-based environmental education of children: Environmental knowledge and connectedness to nature, together, are related to ecological behavior. Global Environmental Change. Volume(47) pp. 88-94. Szvircsek F. 2000: Bányászkönyv. Magyar Millennium. Salgótarján. pp. 49-104. Vásárhelyi J. (ed.) (2010): Nemzeti Környezeti Nevelési Stratégia. Magyar Környezeti Nevelési Egyesület. Budapest, pp. 43-60, 93-96, 218- 223, 239-293. Vertich J. (1990): Volt egyszer egy fogaskerekű. Nógrádi Történeti Múzeum Baráti Köre. Salgótarján. pp. 13-35.